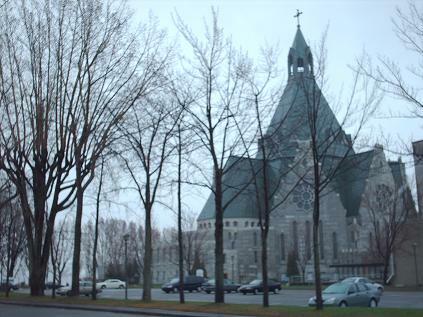 As my bus left Montreal Island, it struck me how different this location shoot would be from the last one. Two weeks ago I was in the “world’s capital” covering the U.S. papal visit; tomorrow I’m embarking on a walking pilgrimage into the Quebec hinterland. It’s hardly rural right now, however, as we’re spending two night in Trois-Rivières (population: 128,000). Yet perhaps in anticipation of the tiny towns to come, I felt a deep sense of peace this morning when I was driven to the local Future Shop, as if this were my last lifeline to urban convenience. What brings me here is the pilgrimage of the Ark of the New Covenant, which we’ve been following with our new series 64 Days with the Ark. While we’ve been producing this show from a distance (thanks to our friends at ECDQ.tv), now I’m present not only to film the portageurs but to become one of them. Notwithstanding the distance from city comforts, I’m most concerned about (a) being perceived as the probing journalist and (b) not speaking French as my mother tongue, unlike most of the participants. Hopefully, I can integrate myself in the group and bring you the stories emerging from this remarkable pilgrimage. 64 Days with the Ark airs Fridays at 8 PM, with repeat presentations Saturdays at 12:30 PM, Sundays at 6:00 PM and Tuesdays at 5:30 PM (EST). Watch online episodes here.